CAPA College Class of 2020 – CAPA College (Creative and Performing Arts College)…excellence in Arts training & education. Wakefield’s first Department for Education (DFE) funded Free School opened its doors in September 2018. CAPA College, a specialist Arts college for students aged 16-19, was one of only 53 Free Schools to open in England this year. It is set to become a flagship for Arts Education in the North. 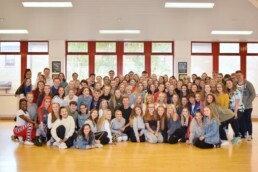 Over 100 excited students arrived at CAPA College in Wakefield in September armed with outstanding GCSE results, a passion for the Arts and an eagerness to take the first step towards a career in the Creative Arts. CAPA College is not your average Further Education institution. At CAPA College students will receive professional Arts training in a range of disciplines – from singing, dancing and acting to costume, set and lighting design – alongside rigorous academic study. Over two years of full-time study students will obtain the equivalent of four A levels as well as the skills, knowledge, training and experience they need to progress to universities, vocational Arts conservatoires and Arts-based employment. Students are enrolled on four distinct pathways (Dance, Drama, Performing Arts and Production Arts & Media) and will benefit from tuition from professional teachers, directors, choreographers, musical directors, designers and technicians while enjoying access to industry-standard facilities. Alongside an outstanding curriculum, students will gain extensive experience performing throughout the UK and working alongside professional artists, companies and theatre venues. This is the beginning of an exciting new chapter for CAPA College (part of Enhance Academy Trust) which will see a significant expansion in the upcoming years. CAPA College will be moving to purpose-built premises on Mulberry Way, Wakefield (opposite Wakefield Westgate train station) in September 2020. As the gateway to Wakefield, CAPA College will offer more opportunities, more facilities and more support to students across the North of England. CAPA College are currently renting temporary accommodation at Cathedral Academy, Wakefield.